Andrew Wehrman is an assistant professor of history at Central Michigan University. In 1760 in the middle of the Seven Years War, Great Britain crowned a new king. George III was only 22 years old and many in England as well as the Colonies privately expressed reservations about his presumed lack of education and experience. He selected as his chief minister the Earl of Bute, a Scottish aristocrat whose only qualification was that he had been the young Prince’s tutor and confidant. It seemed to many, that George III and Lord Bute were hell-bent on ignoring constitutional restraints to destabilize British political order. Bute was blasted in both the British and colonial press. Political writers such as John Wilkes attacked Bute for taking advantage of a weak king and for working outside of Parliament to secure the peace. Wilkes’s writings helped fuel the fear that the king’s ministers were eroding away established political norms with their rampant, power-seeking corruption. Bute resigned from office in April 1763 vowing to get out of politics, but rumors circulated that he was still in control of their feckless king and that Bute was still behind every odious new law. Political commentators used satire to warn Americans of this growing threat to their lives and liberties. When Parliament passed the Stamp Act in 1765, colonists hung an effigy of Andrew Oliver, the Boston merchant who had agreed to collect the hated tax, on a branch of the newly dubbed “Liberty Tree” in Boston. Next to the tree, the colonists constructed an over-sized boot, a pun on Lord Bute, who was widely believed to have been responsible for the act. Climbing out of the boot-top was a grinning figure of the Devil holding up the text of the Stamp Act. 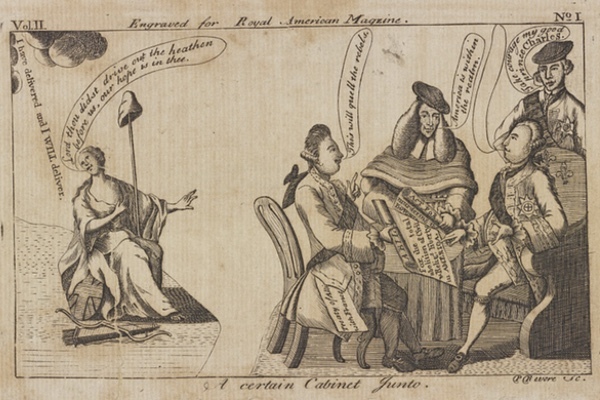 Bute figured prominently in satirical political prints in the 1760s and 1760s, sometimes as a boot but more often as a sinister figure in Scottish garb menacingly forcing the hand of the King to strip colonists of their rights, liberty, and property. 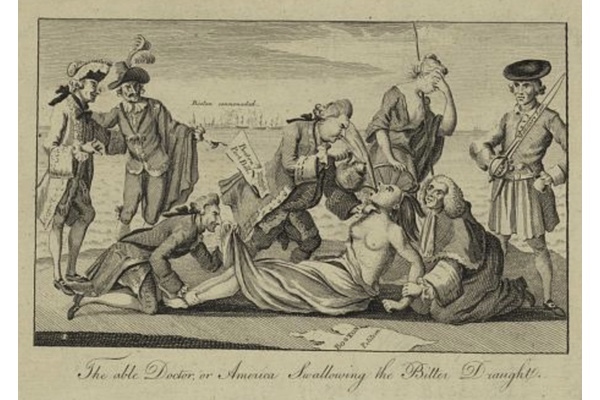 Rather than blaming King George directly for the Tea Act and the so-called Intolerable Acts, a sympathetic British satirist showed Britain’s ministers, supervised by Lord Bute, forcing tea down the throat of America, represented by a Native American woman, as seen above. Colonists would have immediately recognized Bute as well as Lord Sandwich, a notorious womanizer depicted looking up Americas skirts. In another such print created in London in 1776, America, represented as a goose who lays golden eggs, is being held down by the King’s ministers, each of whom would have been recognizable to colonists, to a butcher block for the Earl of Bute to slaughter with his sword. Then as now political satirists warned that neither the British Constitution nor the American Constitution offers much protection against the men and women whom the head of government chooses as his advisors and surrogates. Even if, for instance, Steve Bannon were to resign or be forced out the specter of his sinister visage created by the satirists would still haunt the President. His opponents would still point to him as the author of Trump’s travel ban, his withdrawal from the Paris Climate Agreement, his next executive order, or any other point of domestic or international unrest. Although artists continued depicting Bute behind the scenes throughout the war, by July of 1776 Thomas Jefferson took aim directly at the king himself in the Declaration of Independence. The Declaration makes no mention of the ministers to the Crown but rather lays blame squarely on the king of Great Britain whose actions had “in direct object the establishment of an absolute Tyranny over these States.” Jefferson listed twenty-seven reasons why the American colonists were seeking independence all of which lay blame squarely on “He” the king rather than his ministers. Jefferson asserted “To prove this, let Facts be submitted to a candid world.